Participating artists include: Lawrence Abu Hamdan, Etel Adnan, Haig Aivazian, Mounira Al Solh, Basma Alsharif, Ziad Antar, Marwa Arsanios, Ania Dabrowska, Malak Helmy, Joana Hadjithomas & Khalil Joreige, Hiwa K, Jumana Manna, Joe Namy, Setareh Shahbazi, Raed Yassin and Shirin Yousefi. The sixth annual exhibition by Uncertain States brings together the excellence and diversity in photography. This years exhibition includes over fifty artists from the collective who have contributed to the Uncertain States projects over the years including Adele Watts, Agnieszka Kozlowska, Almudena Romero, Alys Tomlinson, Angelo Picozzi, Ania Dabrowska, Aviv Yaron, Carol Hudson, Charlie Fjatstrom, Chloe Hayes, David George, Eva Bachmann, Faye Heller, Fiona Yaron-Field, Francesca Centioni, Franscico Gomez de Villaboa, Geoff Titley, George Miles, Georgie Scott, James M Barrett, James Russell Cant, Jennifer Pattison, Julie Hill, Karl Ohiri, Laura Hynd, Lee-Ann, Lesley Farrell, Lucy Levene, Marc Newton, Marcia Michael, Michelle Marshall, Mick Williamson, Mir Gwiliam Parkes, Mitch Karunaratne, Nick Haeffner, Richard Ansett, Richard Sawdon-Smith, Riikka Kassinen, Robert Davies, Robin Grierson, Roy Mehta, Sally Annett, Sara Moralo, Sean Gallagher, Simon Brann Thorpe, Shelley Theordore, Spencer Rowell, Sonia Lenzi, Susan Andrews, Tracey Holland, Valentina Casalini and Victoria Kovalenko. 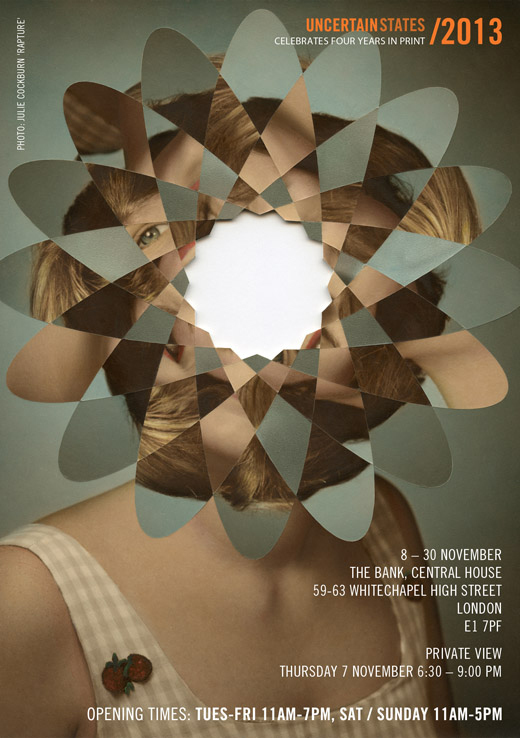 Uncertain States is pleased to announce the Fifth Annual Exhibition UCS 2014 at The Bank Gallery from 14th November – 5th December 2014. This years artists include Adrian Hardy, Agatha A. Nitecka, Ania Dabrowska, Cat Stevens, Charlie Fjatstrom, Christina Reid, David George, Fiona Yaron-Field, Franscico Gomez de Villaboa, Heather McDonough, James Russell Cant, Josephine Coy, Karl Ohiri, Martina Geccelli, Mick Williamson, Mish Amikoff, Radoslav Daskalov, Richard Ansett, Rebecca Sainsot Reynolds, Richard Sawdon-Smith, Robin Grierson, Roy Mehta, Spencer Rowell, Susan Andrews and Tracey Holland. Tue- Fri: 11 am – 7 pm, Sat & Sun: 12 pm – 5: 30 pm. helloA Lebanese Archive KICKSTARTER CAMPAIGN by Book Works. LAUNCHED 28th Aug 2014; LIVE for 30 DAYS. JOIN US in a race to reach our funding target for A Lebanese Archive book by Ania Dabrowska in just ONE MONTH, to be published by Book Works and the Arab Image Foundation in Spring 2015. Follow a link for more information, a short film about the project (by Lukasz Wolagiewich, Lima Charlie TV) and loads of unique Kickstarter rewards. Four Corners and Uncertain States are delighted to launch Editions, a new collection of limited edition prints by award-winning, contemporary photographers from the Uncertain States collective. Where does an archive end and ‘real’ life begin? How to dream a dream of (migrant) home without waking up from a nightmare? What are the unlikely convergences between political, historical and cultural histories of Lebanon, Poland and Great Britain that contributed to the emergence of this project? Mind Over Matter at the University of Cambridge Science Festival 2014. Ania Dabrowska, Prof Bronwyn Parry (KCL) with Prof Carol Brayne, CIPF talk about Mind Over Matter, a Wellcome Trust People Award since-art collaboration on the search for cures for dementia. Archives are no longer easily defined and this discussion encompasses a range of approaches: from the historical and institutional; the personal and family record; fictional narrative; digital repository and artists using found images as a catalyst for extraordinary projects. Chaired by Sue Steward, panelists include Martin Barnes (Senior Curator of Photographs at the V&A Museum), Ania Dabrowska, Melinda Gibson and Pete James. Uncertain States 2013 – Annual Group Photography Exhibition. With thanks to Polish Cultural Institute in Delhi for nomination and support of travel for this residency. 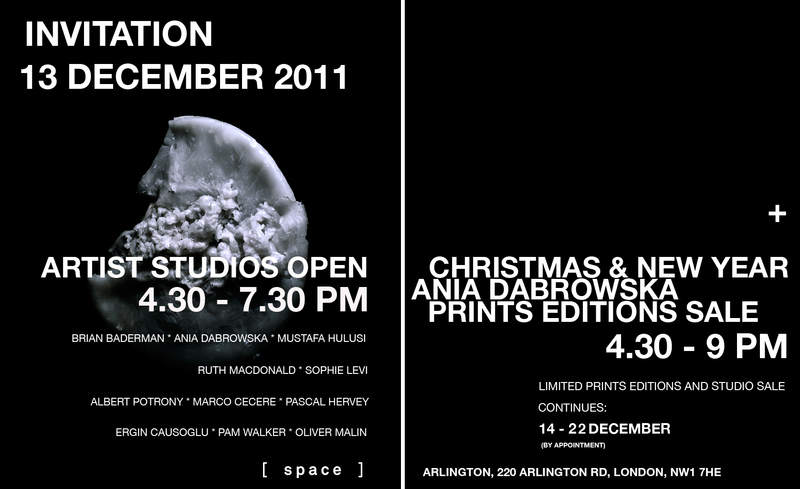 Exhibition celebrating 3 years in print. 12 October 2012 / Fotosynthesis / Lilian Baylis Old School, Lollard Street, SE11 6PY, London / 12.30 pm – 22.30 pm / Book here. The Uncertain States First Tuesday Talk: Ania Dabrowska, Memoria. House of Homeless exhibition marks the end of Ania Dabrowska’s Arlington residency showcasing new work: Arlington Portraits series, Lebanese Archive of Diab Alkarssifi research project, and selected work by residents of Arlington. 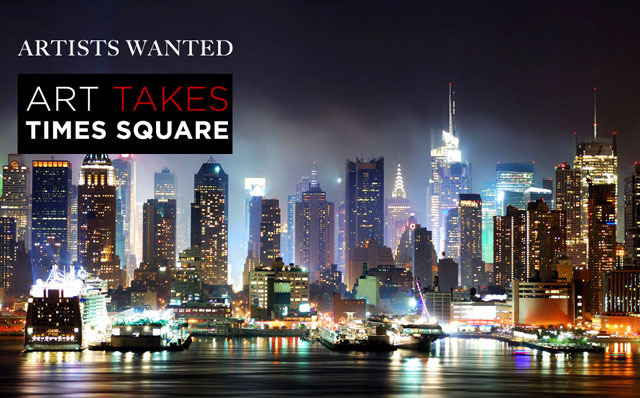 Arlington Portraits series has been selected for Art Takes Times Square exhibition organised by Artists Wanted. Work by artists from around the world, that received the highest volume of public votes in an international competition, will be shown in brilliant lights on a massive scale billboards in one of the most iconic locations in the world. Thank you to everyone who has contributed to this amazing achievement! 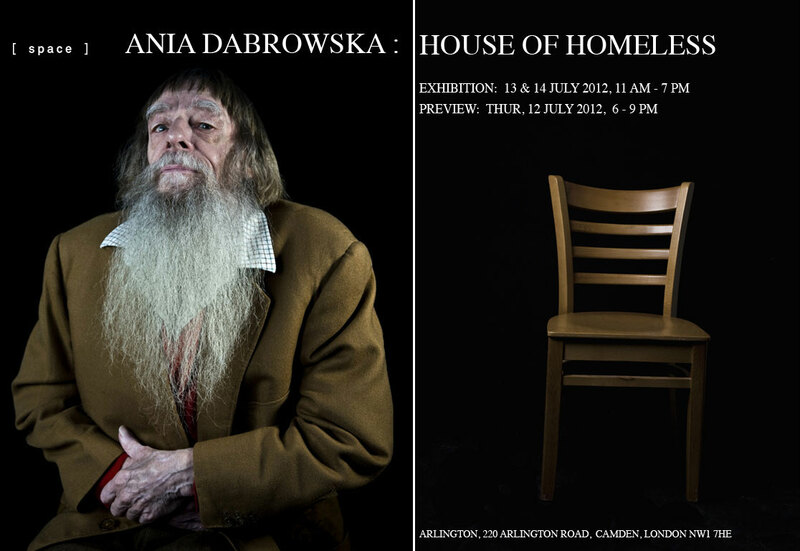 Arlington Portraits series has been created as part of Ania Dabrowska SPACE residency at Arlington, an iconic London hostel for homeless men and women, run by One Housing Group and re-developed based on a model of Common Ground project for the homeless in Times Square. ‘Brains’ asks not what our brains do for us, but what we have done to brains. Wellcome Collection’s major new exhibition featuring real brains, artworks, manuscripts, artefacts, videos and photography…including Ania Dabrowska’s works from The Brain Donors (photography), After I’m Gone (photography), and Memory Ends. (sound work, Ania Dabrowska & Gaetano Serra) – Mind Over Matter project. Ania Dabrowska will be speaking at the Circus Fest forum event, presenting her SPACE residency work with the Creative Space programme at Arlington. Speakers include PhotoVoice, Skateistan, LSE – Underground Sociabilities, Lake of Stars Festival, The Creative Space programme, and the Sapana Circus.